The University of California, Berkeley's Fung Institute for Engineering Leadership has conservatively estimated the size of the equity and debt based crowdfunding market to be at least $3.98B. The Program for Innovation in Entrepreneurial and Social Finance, part of the Fung Institute co-authored the study. From the lenses of Angels, VCs and Small business lending we believe a market as large as $3.98B per year could rapidly evolve. Crowdfund investing, a mechanism for raising capital for businesses to start and grow, from small investors, will go live later in 2013. With the release of the proposed crowdfunding rules, a wave of small business and startup financing is expected to sweep the nation. 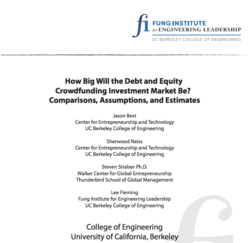 In a first of its kind study, the Program for Innovation in Entrepreneurial and Social Finance, at the College of Engineering at the University of California, Berkeley released a primer on the size of market. Jason Best and Sherwood Neiss are co-founders of the Berkeley program and serve on the leadership team. Jason Best is a co-founder and principal of Crowdfund Capital Advisors (theccagroup.com) and currently Entrepreneur-in-Residence at the Center for Entrepreneurship and Technology in the Fung Institute. Sherwood Neiss is also a co-founder and principal at CCA. Both Neiss and Best created the Startup Exemption (startupexemption.com) framework that was the basis for the crowdfund investing legislation. Both are also founders of the Crowdfunding Professional Association (cfpa.org) and Crowdfunding Regulatory Intermediary Advocates (cfira.org). They are recognized globally for their expertise and experience in crowdfund investing policy initiatives and are the authors of Crowdfund Investing for Dummies(Wiley).